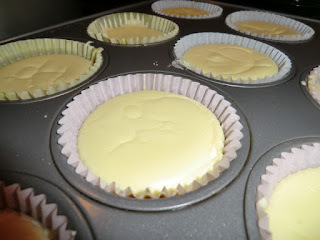 Preheat oven to 325 and add cupcake liners to a 12 cup muffin pan. With a mixer, beat the cream cheese until smooth. Slowly incorporate the Splenda, blending well. Stop using the mixer and switch to a wooden spoon. Add vanilla, lemon juice and sour cream. Blend just enough to mix the ingredients. Add the eggs one at a time, gently mixing after each. Divide batter into the 12 cups (I like to use an ice cream scooper for this). Bake at 325 for 15 minutes. Let sit and cool for 30 minutes then transfer to fridge and cool for at least 2 hours before eating. Tr to stop at just one!